This is one of a series of drawings of heads studied from life for the Apostles in the Last Supper, and the closest to its painted equivalent in the final painting. Here, Leonardo exploits the softness of the black chalk to model the head and graceful features of the young St. Philip. 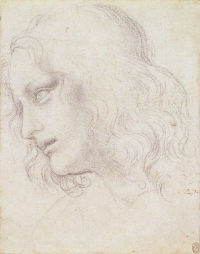 The sfumato or “smoky” effect produced by blending the chalk lends the drawing an atmospheric quality by imitating the effects of diffused light on the form. This enhances the expressive quality of the drawing and conveys the inner state of mind of the young saint as he gazes reverentially towards Christ in the painting.